Why facility user groups expose schools to a huge liability potential. Why users such as camps, teams, leagues, special event operators, and tournaments must carry their own insurance. Why not just any insurance will adequately protect schools. Provides a specific webpage that is a reputable source of high limit, high coverage sports insurance to which facility users can be referred to INSTANTLY bind coverage and issue certificates of insurance naming school as Additional Insured. How we can set up your school/school district on our automatic certificate of insurance issuance system to meet your special wording requirements every time. Nothing is more frustrating than having to tell a facility user that their insurance does not meet your requirements. All of the above speeds the process and reduces hassle and frustration for all parties involved. referring uninsured facility users to a specific web page where they can get an instant quote, instantly pay, and bind coverage without any delays or hassles. Their delays and hassles become your delays and hassles. setting your recreation department up in our system so that the certificates of insurance meet your special wording requirements every time, which cuts down on your frustration over certificates that don’t meet your requirements. The video below walks you through the process in more detail. 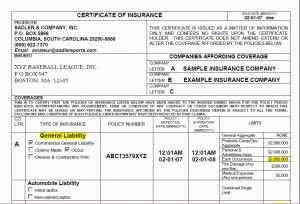 A General Liability policy was taken out under the name of Northeast Youth Football League and its member teams. A certificate of insurance evidencing “additional insured” status was issued on behalf of a member team to the field owner as required by agreement. Another member team wanted to use the fields and the same certificate of insurance was submitted. A spectator was injured in a fall from a bleacher during a game played by the second team. Great American E&S Insurance Company denied the claim and sought a declaratory action for its responsibility to pay for the injury. 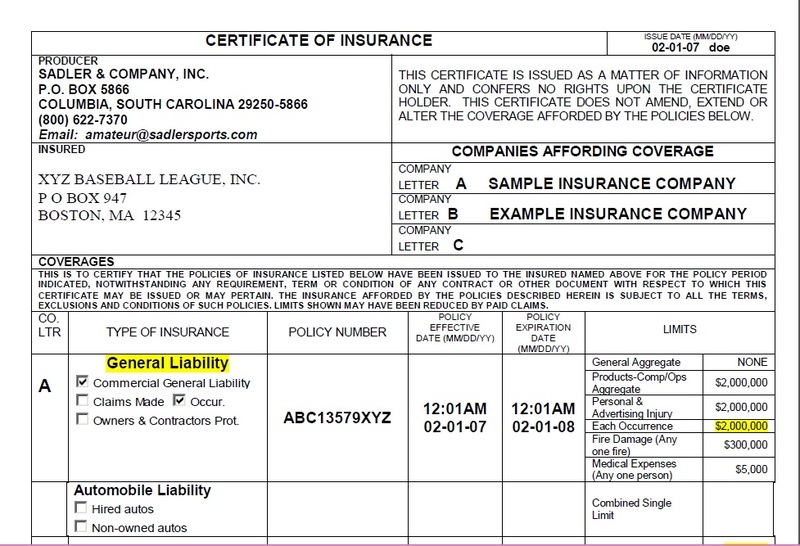 Great American unsuccessfully argued that the certificate of insurance did not apply to the second team since its name was not listed on the certificate of insurance. The Supreme Court, Appellate Division, Third Department, New York disagreed by reasoning that neither the certificate of insurance nor the policy included the names of any of the teams, but instead listed only the league and its member teams. Great American also argued that two separate policy exclusions would be applicable. The first was a Design Defect and Structural Maintenance Exclusion and the second was an exclusion stating that Additional Insureds were not covered for their sole negligence. However, the court reasoned that the latter exclusion could apply but said that the insurance carrier waived its right to use it as a defense since no written disclaimer was sent specifically mentioning their intent to use such exclusion. Had the carrier given proper notice, it is likely that they could have properly denied the claim for the additional insured field owner, who was likely solely negligent in the slip and fall accident. The only way for the team to have shared in this negligence would have been due to lack of supervision or if the liability had been contractually assumed in a lease or license agreement.